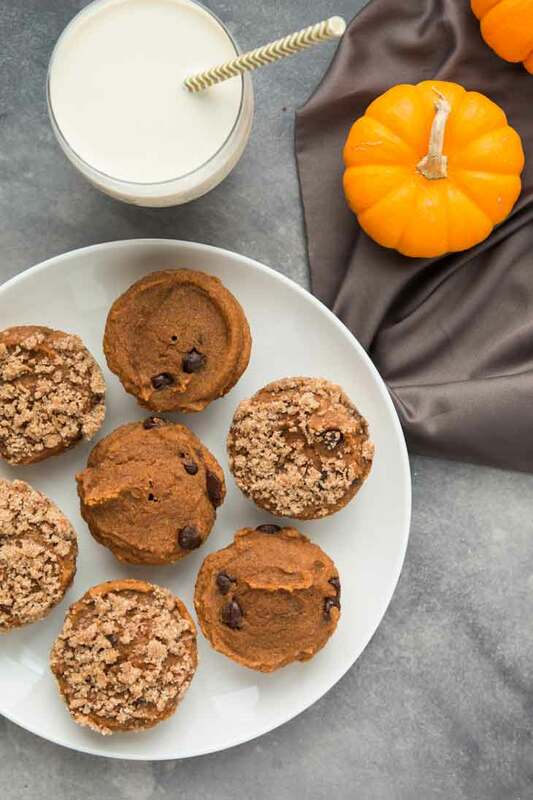 These vegan pumpkin spice muffins are fluffy, moist, and super soft! They’re perfect to have on hand for a quick breakfast, healthy snack, or dessert! 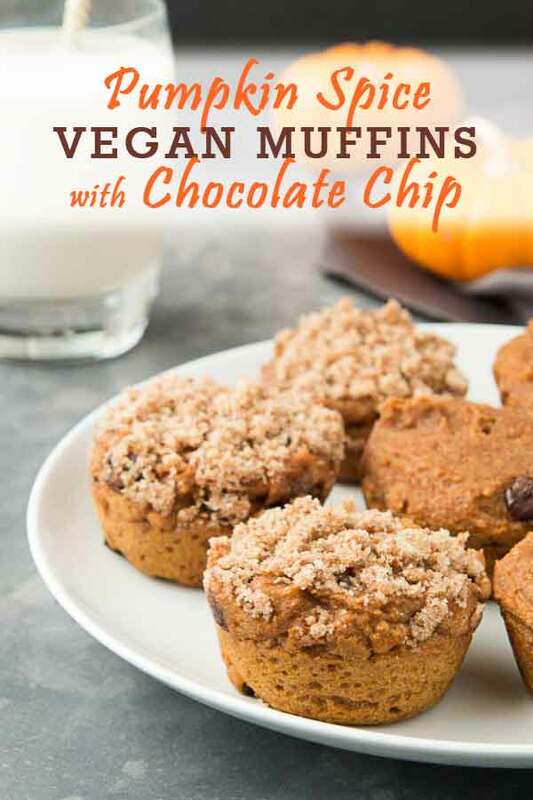 Check out the recipe and review of The Vegan 8 new cookbook! If there are two baked goods that disappear as fast as I place them out, they’d be MUFFINS and DONUTS! So easy to just pick one up as you’re passing by. Not to mention you can eat them all day long! Breakfast, snack, lunch, dessert…there’s never a wrong time to grab one! Especially when they’re made from one of my favorite cookbooks! Brandi, the extremely talented blogger behind The Vegan 8, just came out with her very first cookbook! I’m excited to be sharing her Baked Pumpkin Spice-Chocolate Chip Donuts! I ended up turning them into muffins, as her recipe indicated as well because I don’t have a large donut pan. Although I’m heading out this weekend to get one now and make the original donut version. 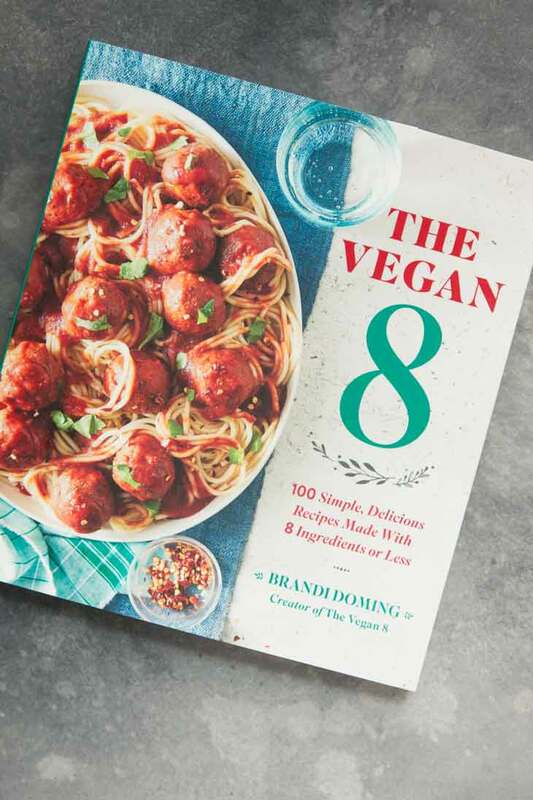 Check out the review of Brandi’s The Vegan 8 cookbook, make the recipe, and enter to win a copy in the giveaway below the recipe! And if you can’t wait, you can order your own copy here! Brandi’s site was one of the first vegan blogs I came across, and I’ve been hooked ever since. Not only is she is a sweet, genuine, down-to-earth person, but her photography skills are unbelievable, and all her recipes are delicious! While all of her recipes are simple in terms of ingredients, none of them skimp on flavor. Her dishes are bold, tasty, clever, unique, and allergen-friendly! The notes section in each recipe is awesome. She has great tips for each recipe and ingredient substitutions in case you need. This cookbook focuses on classic dishes and comfort foods made easy that satisfy any diet and for any occasion. Dishes like Baked Mac n Cheese, super creamy Artichoke & Spinach Dip, cakes, brownies, and sauces and dips you can use throughout the week! Each recipe has a mouthwatering photograph and is meant for the entire family to enjoy. I’ve already dug into her book and made several recipes, all delicious and family-friendly! Especially on those weekends where I had no urge or time to cook…I headed straight for Brandi’s Time-Crunch Lunches section and made her Elevated Avocado Toast and Mexican Tahini Chickpea Tacos! Both of which took no time at all, left my family satisfied, and contained pantry-staple ingredients! The original recipe was for baked donuts…which was what attracted me to it in the first place. Of course, I had all the ingredients on hand, but only a mini donut pan. Brandi’s notes for the recipe state that they can also be turned into muffins…so that’s exactly what I did! The first back was gone within half a day…after school snack, after dinner dessert, and of course then there’s me who grabbed one almost everytime I walked by (oops!)! 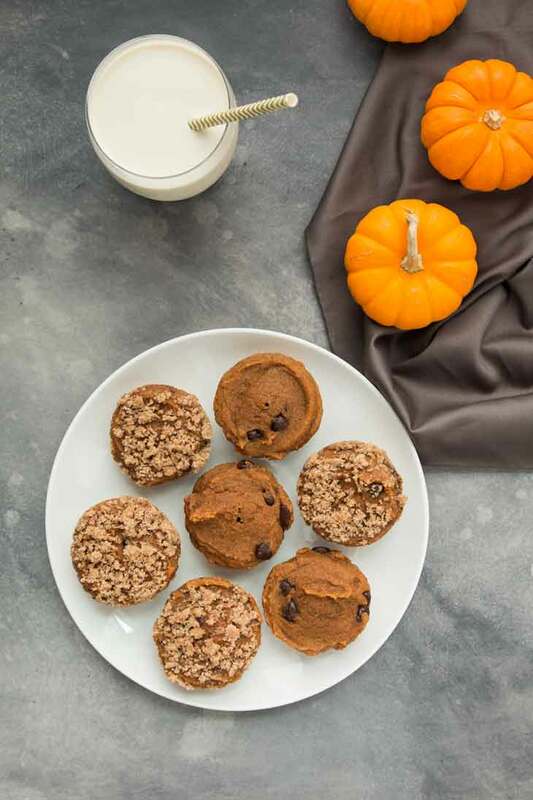 These vegan pumpkin muffins with chocolate chips are soft, fluffy, and super moist! I love that there’s no oil in this recipe, and instead, it makes use of vegan yogurt! Since then I’ve bought a large donut pan and made the donut version. Honestly speaking, I love the donut version of this recipe more. Perhaps it’s because they’re donut- shaped ha, not sure what it is, but regardless…muffins or donuts…this recipe is perfect! This recipe is really straightforward. Whisk together all the dry ingredients, then add the wet ingredients and chocolate chips. Mix once more and your batter is done! Once the oven is preheated, fill a large donut pan (or muffin pan), and pop it in the oven! Let them cool completely before devouring! You can even add a chocolate glaze on top, or a sugar-spice mixture or crumble as I did on some of the muffins. 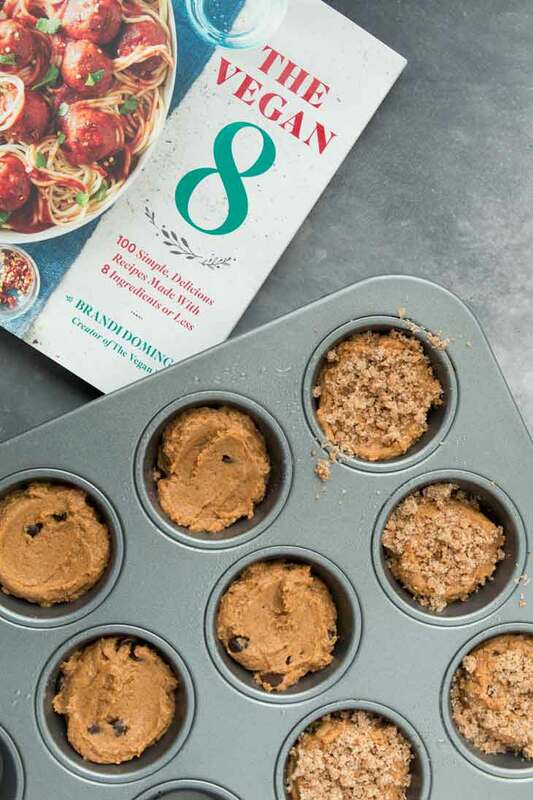 Make this recipe from Brandi’s new The Vegan 8 Cookbook, and don’t forget to enter the GIVEAWAY for a chance to win your own free copy! You can also purchase her new cookbook on Amazon. Just because you crave a donut doesn't mean you need to resort to a greasy fried one. 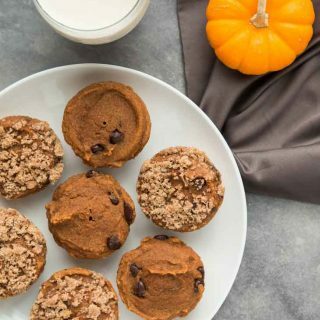 These pumpkin spice ones are fluffy, moist, and super soft. Reprinted with permission by Oxmoor Press and Brandi Doming/The Vegan 8 © 2018. Preheat the oven to 350 F (177 C). Spray a regular size 6-donut pan with nonstick spray. 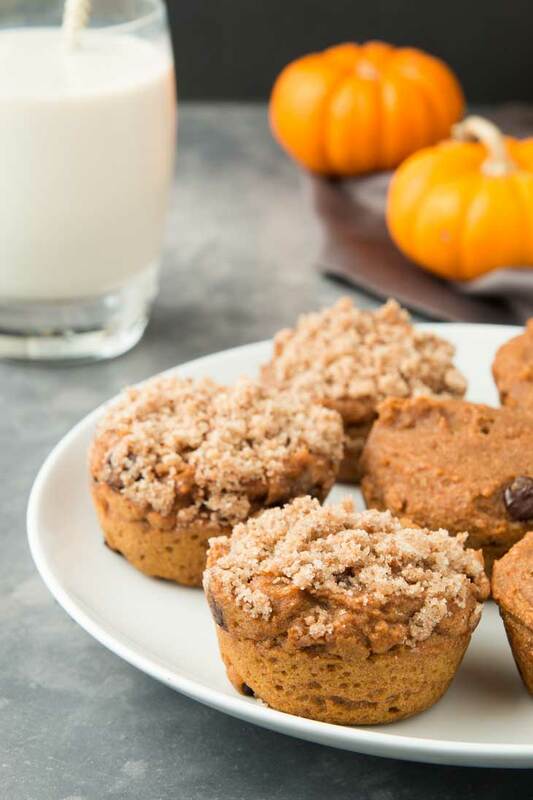 You can also make these in a regular-size muffin pan. 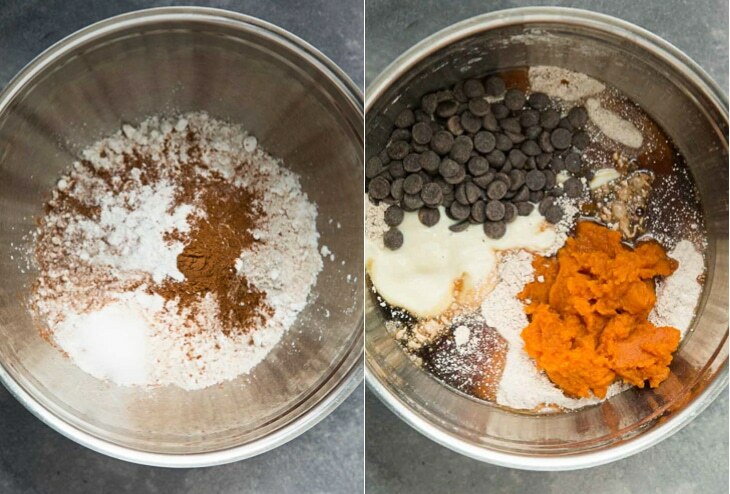 Add the flour, cornstarch, pumpkin pie spice, baking powder, and salt to a large bowl, and whisk well. To the same bowl, add the syrup, pumpkin, yogurt, and chocolate chips. Stir the ingredients well until a smooth batter is formed. The batter will be on the thick side. Be careful not to overmix. Spoon the batter evenly into the prepared pan. Using the back of a spoon, smooth and flatten out the tops of each donut. If you don't do this, they will bake up really lumpy and ugly. if you're making muffins, I find using an ice-cream scoop gives a nice rounded top. Bake at 350 F for 15 minutes or until the donuts have risen beautifully, are fluffy, have a golden-brown top, and lightly spring back when touched. Muffins may take closer to 20 minutes. Look for a clean toothpick when it's inserted in the center. Let the donuts cool in the pan for about 5 minutes and then carefully flip them over onto a cooling rack. Let them cool completely. Once cooled, store any extras in a large, sealed container or ziplock bag so they don't dry out. If making muffins, you should get about 8 total. Be sure to use regular spelt flour, not sprouted. To make these gluten-free, you can sub the spelt flour with superfine gluten-free oat flour (160g). Please keep in mind that the oat flour does make these more dense, but the flavor is just as good. Baking times are basically the same. Check for a clean toothpick. For the yogurt, I use soy but any will work. If you can't find vanilla-flavored yogurt, add 1 teasp vanilla extract to the recipe. I topped a raw sugar, spelt flour, pumpkin pie spice, vegan butter mix crumble on top of some muffins prior to baking. Open to US residents, must be 18 years or older to enter. The winner will be notified via email and announced in this post and in the comments of this post. The giveaway starts NOW and ends midnight November 18, 2018. Good Luck! Dang, just about everything has already been veganized!!! I can't think of anything that I consider comfort food that You and other wonderful bloggers have not turned deliciously vegan! So thank you!!!!! You are a blessing!!!! Aww thank you!! Yes...most things have been veganized and even perfected! True...thanks so much for the kind words! This cookbook is awesome so good luck! Thank you so much Anjali for the review, I really appreciate it! I'm glad the muffins worked out for you! Yes!! And I'm totally going to invest in a proper scale soon :) Thanks Brandi and what an awesome cookbook you put out! That's so true...most recipes have been veganized and there are so many different versions. A nut-free and soy-free cheesecake sounds awesome!